1.Hermetically Sealed 1.1 Hermetically Seals without Gas Cushion Hermetically Sealed Transformer without gas cushion is one type of oil immersed transformer in which the tank is fully filled with oil. The tank is completely sealed so as to prevent moisture and oxygen from entering into the transformer. When transformer oil comes in contact with oxygen and moisture, the chemical reaction will cause oxidation reaction which leads to cause insulation failure inside the transformer and the transformer becomes less life or will be short circuited. Internal pressure will depend on the load and temperature of the transformer, the higher the load, the higher the pressure. Hermetically Sealed Transformer without gas cushion will also come together with corrugated-finned tank which has specific properties to expand and contract, without any damage, according to the changed volume due to variation of internal pressure. 1.2 Hermetically Seals with N2 Hermetically Sealed Transformer with N2 is one type of oil immersed transformer in which the tank is fully filled with oil. The tank is completely sealed so as to prevent moisture and oxygen from entering into the transformer and also filled up above the top of oil with nitrogen gas. When transformer oil comes in contact with oxygen and moisture, the chemical reaction will cause oxidation reaction which leads to cause insulation failure inside the transformer and the transformer becomes less life or will be short circuited. Internal pressure will depend on the load and temperature of the transformer, the higher the load, the higher the pressure. Hermetically Sealed Transformer with N2 will also come together with corrugated-finned tank which has specific properties to expand and contract, without any damage, according to the changed volume due to variation of internal pressure and also the N2 will perform as a cushion at the same time. 2. 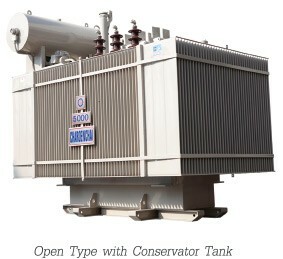 Open Type with Conservator Tank Open Type with Conservator Tank is one type of oil immersed transformer which is equipped with oil conservator and has air inlet and outlet to release internal pressure from the expansion of the oil volume due to the variation of internal pressure depending on the load and temperature of the transformer,the higher the load, the higher the pressure. Air inside the tank can go outand come into the tank, so called "Breathing", via the breather which is connected to the conservator. In order to prevent moisture and oxygen from entering into the transformer, which can cause oxidation reaction leading to cause insulation failure inside the transformer and the transformer becomes less life or will be short circuited, the breather shall be filled with desiccant agent call "Silica Gel" and, therefore, it is necessary to look after silica gel to be clean and fresh at all times.